I am pulling my blender out in the morning to see if I have a jar that will fit. 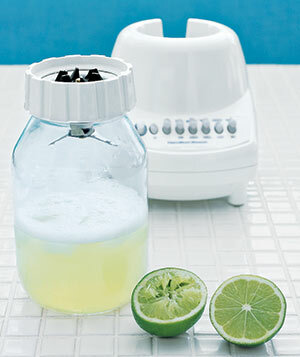 This idea from Real Simple was intended as a fix if your blender jar was broken, but it looks just like a magic bullet and would be a fun way to make homemade lemonade and limeade for a party. Great idea. Mine is not broken, but it's nice to have the option of using something other than the big glass piece when doing small things. Thanks! They actually suggest trying an old mayo jar. I guess they have had the best luck with those fitting!